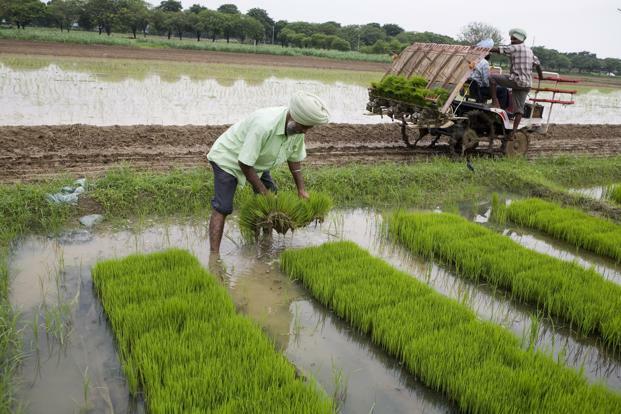 Crops are sown at the beginning of the South -West monsoon and harvested at the end of the South -West monsoon. Important crops: Jowar, bajra, rice, maize, cotton, Jute, groundnut, sugarcane, tobacco etc. Crops need relatively cool climate during the period of growth but warm climate during the germination of their seed and maturation. Sowing season- (October -December) and harvesting season (February - April). Important Crops: Wheat, barley, gram, linseed, mustard, masur, peas and potatoes. Crops which are being raised throughout the year due to artificial irrigation. Zaid Kharif: Sown in August-September and harvested in December-January. Important crops include rice, jowar, rapeseed, cotton and oilseeds. Zaid Rabi: Sown in February - March and harvested in April -May. Important crops are watermelon, cucumber, leafy and other vegetables. Total geographical area of India: 328.7 m. ha. Total Net Irrigated Area: 38.80 m. ha (27.66% of net sown area). An irrigation farming system relies on help from an irrigation system supplying water from a river, reservoir, tank, or well. As India grows and there is an increasing demand for food, water is becoming more and more crucial. Farming methods should be focused on sustaining or recycling water. Shifting Cultivation refers to the form of cultivation where a large area is cultivated for few years and then abandoned for some time until the fertility of the land is restored naturally.In tribal India shifting cultivation is widely prevalent, though it is known by different names. Intensive commercial farming: With small landholdings and a high population, many farms use a lot of manpower on a relatively small piece of land. Extensive commercial farming: This is the opposite of intensive commercial farming. A small workforce is applied to a large piece of land. Cultivation depends on mechanical methods. Plantation agriculture: A plantation is a large piece of land with an estate (typically in sub-tropical or tropical countries) where crops are cultivated and then sold internationally as opposed to locally. This type of farming is used to restore soil fertility in India’s drylands. A plot of land is used for grain or other crops and when the soil starts to degrade, the land is left uncultivated. It is used to grow hay or as a pasture for grazing animals. After a number of years, it can be used for crops again as the nutrients are restored by ploughing. Land erosion during the ley period is also prevented by the roots of the grass. As mentioned before, this is the large-scale cultivation of one crop on an estate or vast property. This system is designed to make a profit and as such requires that all technology and techniques be efficient. Tea, coffee, and rubber are all commonly-grown on plantation farms. Teak wood, bamboo, and timber are also occasionally farmed using this method. This system is a type of subsistence farming. Usually, there are one or more farmers responsible for the labour and the produce is for their own consumption. A crop rotation schedule includes different varieties of crops such as wheat, barley, mustard, or millet being grown during alternating seasons. The benefits are that weeds, pests, and diseases are controlled, while soil fertility is maintained. Cooperative farming systems in India have only recently appeared. The aim of these systems is to combine land resources and farmers so that everyone benefits. There is huge potential to build on this method in India; unfortunately funding has been slow to make it possible. Families are attached to their land and unwilling to give it up to be shared in a cooperative system, farmers fear they will lose their jobs, and there is an immense amount of propaganda related to “new” lines of thinking. India ranks 7th in the world in terms of total geographical area but 2nd in terms of cultivated land. India has total geographical area of 328.7 million hectares out of which142.60 m hectares is the net sown area. It is about 46.59%. Arunachal Pradesh has only 3.2 percent area under net cultivation while in Haryana and Punjab it is 82.20 percent. In Punjab, more than 94% of the total cropped area is irrigated. In India, out of the net cropped area of 142.82m hectares, only 55.14 million hectares (38.5%) are irrigated. India stands next only to China in the production of rice contributing 21.5percent of the world population. Bengal is the largest rice producing state contributing to more than 14.6% of the rice production of India, but in term of yield per hectare Punjab and Haryana occupy the top rank. Soviet Union, United States and China are the countries which produces more wheat than India. In term of production U.P. ranks first while in terms of yield Punjab ranks first in India. India is the second largest producer of sugarcane after Brazil and it has the largest area under sugarcane cultivation. India grows 7% of the total world production of tobacco which is next only to China, U.S.A and Brazil. Kerala is considered as the “spice state of India”. “Harrison” and “Virginia Gold” are the high yielding varieties of tobacco.